The Radionic Ships of the Heavenly Host | Rainbow Radionic Effects. Radionic effects caught in Sunlight also show up as that called 'Fire Rainbows', which is completely incorrect as they are neither fire nor rainbows. More simply they are just called iridescent clouds. More seriously they are called circumhorizantal arcs, found within the cirrus and lower cloud levels. More exactly many are Sun caused prismatic effects upon Radionic Clouds. All work and no play makes everyone wish they could. So consider the following set of images more like eye candy and play time, and less like classroom and work time. No revelations here except for the un-bounding beauty of nature when given a little boost from the Radionic Host. It turns out that nature likes to play a symphony with ionnics in a big way. The only requirements for inclusion herein are that some kind of Radionic activity is present and that the Sun has its hand in on it. Then, not only are they interesting, they are also down right pretty. The following photograph below, presenting a nice big piece of a rainbow and a nice big piece of Radionics together all for the price of one, in what Scientific slows call a circumhorizantal arc is as good a place as any to start. This features a well set up Mother Ship Field well lit up by the sun. The photograph, found as the feature photograph on the webpage of the US National Weather Service's web site dealing with circumhorizantal arcs, was actually taken in Fredricton, New Brunswick, Canada in the summer of 2013. By co-incidence, the photo was taken by none other than the friend of the cause from Huntsville, Ontario who has contributed a number of photographs for this Revelationnum and was living in Fredricton at the time. Also notice the busy clutch of Mobile Scout Ship condensates at the top left of center, plus many more in the remaining clouds all over the place. Figure 1 - When I'm buzzing everyone's buzzing. The second very similar example, also found on the Weather Service's website was taken on April 25; 2018 at 10am in the Monterey San Francisco area. This time featuring a stretched out Father Ship pod which was also generating a healthy array of Radials at the time the photograph was taken. Figure 2 - Follow the Yellow stone path. A similar shorter rainbow sits in the following Mother Ship Fall Hole image at an unknown time over Wonthagg Australia. Figure 3 - Better than Crayollas any day. The above Figure's portly Father Ship brother was also found on the Internet sitting in a fat Flying V Positive Pole Radionic Fields coming out from the right. Notice also in the bottom part of the Fall Hole, a small horizontal Mother Ship sits right under. Figure 4 - Better than water colors too. Like Figures 26, 27, and 28 in Starrgram 11, the same Fall Hole at a somewhat different time and location can tell a lot, such as the below alternate Internet photo of the Figure above. Like the Northern Lights, these things can change on a dime. In the photo below the small slanting Mother Ship line under the Fall hole has morphed into an obvious small Mother Ship Field similar to Figure 2 in Starrgram 5. Also a Father Ship Field has morphed into the picture at the bottom right and considerable thicker cloud elements have moved in over the Flying V at the right. Although it's a bit of a head bender trying and figure out from where the second photo was taken although, obviously way to the right and obviously way into dusk. Figure 4 - Better even than oils. When just a part of a Fall Hole is lit, the results can still be impressive as the following Father Ship Figure from the Internet shows. Figure 6 - It's better to be half lit than plastered. Scott, otherwise known as Cyclops from the X Men, got the idea for his visor from the Internet picture below. The fact that he got them over thirty years before the Internet was even invented is moot. What's your point. Figure 7 - Take that and that you dirty rat. Scott's cousin Lars has one too. He uses his to watch out for Chemtrails. Figure 8 - I smell one now, I think it's close. Scott's sister Magnolia has a visor too. Her's is big, she's Hollywood Kid all the way. Figure 9 - I use mine to ward off Paparazzies. Similarly, the following Internet Figure featuring a beautiful horizontal rainbow, is suitable as a candidate not so much for a Radionic Field, as for Mobile Scout Ships all over the place. Figure 10 - And the Emperor thought he really had something. At least you can see my stuff. The frilly Father Ship photo below from the Internet really turns on the acrylic. Mobile Scout Ship condensates also abound around the Cumulus clouds in every direction. Figure 11 - Look, there's two more on the left. A similar frilly Figure from the Internet below, turns on the acrylic even more. This one was obviously taken from a plane looking at a plane, no doubt marveling at the radiations and completely missing the Radionics. Also notice the Father and Mother Ship pair Field at the center left. There are also condensates along the tops of the bottom clouds, plus obvious Condensate combinations at the upper center and upper right. UFOlogists tend to disdain the lot because they are not silver and not zipping around making humming sounds. Figure 12 - Ladies and Gentlemen we are pleased to announce there will be no extra charge for the view to the left. There will however be a small fee for landing. For sheer prismatic dazzle however, it's hard to beat the following nicely lit up semi-vertical Mother Ship ionnic looking a bit similar to Figure 8 in Starrgram 5 also from the Internet only left to right. Figure 13 - What the heck's a prism you ask. The following prismatic effect, loaded with Volume II type goodies in the cloud at the left was likewise found on the Internet. Notice the little finger like thing casting a shadow at the top right of the left side cloud. That's got to be pretty dense. Figure 14 - A prism is Radionic event lit up by the Sun. The next image below, also from the Internet, is included for both the almost perfect prismatic beauty and also for the slew of Condensates tucked away around the edges of the clouds. No missing pixels in this one. Who knows what kind of field the ionnizations are from, but Holly Molly Molley bring out the easel by golly, this one is right out there. Figure 15 - And this Ladies and Gentlemen, is where those prism things come from. More subdued Radionics in partial Radionic Fields also commonly occur. The following Figure of a frilly spray from the Father Ship lying horizontally back of the mountains is loaded with Condensates in both the Radionic Field and the cumulus clouds sitting around below, And definitely rates a stay on any page in Facebook. The following from the Internet is the surprise catch of a fully lit up Father Ship seed pod Cloud, shown as a partial blow up of Figure 35 of Starrgram 6. Also, notice the huge slew of condensates in the cumulous cloud at the right. No doubt about it, somebody caught a lucky camera. Figure 17 - I finally got tired of monochrome all the time. Likewise, in the following Figure from off the Internet, Lewis and Clark pause for a second to collect their bearings. Figure 18 - I think it's left. Likewise, the following image of the left half of a close in Father Ship, also in the process of forming or un-forming as the case may be, and also having a slew of condensates hidden neatly away in both the upper left and upper right cumulous clouds. Also for scale, look at the Contrail in the upper middle. Also, for fun also check out the myriads of Volume II type condensates and gumballs in the bottom half. Figure 19 - You can do everything better than I can. 'No I can't'. 'Yes you can, yes you can, yes you can'. The following amazing radiation effect on a partially formed Positive Anchor Ship Radionic Field, is right up there too. Particularly since it is also refracting a beam of light straight down onto whoever or whatever is down below. Also notice that it's not that far away. Also notice that it's missing a lot of pixels, came that way off the Internet. Figure 20 - Whenever someone sees the light, expect a lot of Bible thumping to follow. Again, for sheer Mother Ship Radionic beauty, the Figure below has to be right up there. 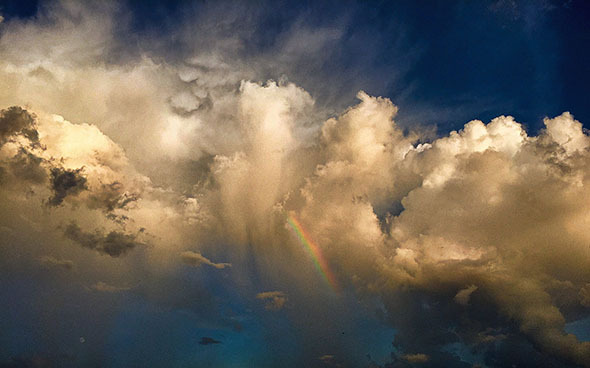 Figure 21 - Prisms are rainbow like colorations sometimes seen in Radionic Clouds. Class dismissed. Likewise, the following from the Internet says it all. Also, notice the neat little Mobile condensate caught with its guard down sitting right in the open in the cloud opening to the left of the trees at the center right. Positive pole Condensates can be commonly seen moving slowly from cloud cover to cloud cover appearing as little silver or white spheres. UFOlogists love those. The darker Negative pole ones are usually not seen very often as they match too closely to the blue sky backdrop behind them. Figure 22 - Bummer, caught in the act. Also, caught in the act, again from off the Internet are a pair of white gumballs at the upper left. They're much smaller so much farther away. Figure 23 - Speaking of farther away, although the Moon is only one eight the size of the Earth it's farther away. Likewise caught in the act in the sun, the beautifully colored saucer shaped Mother Ship condensate below almost looks like a Belgian waffle, also shown in a different take in Figure 44 in Starrgram 5. The sun shadow on the clouds behind is a nice touch too, also interesting as it's from the cloud in front and not the ship as it covers part of the ship too. This must have been quite the event. The two Figures cited are the same even but not the same photograph. In fact, there are about ten different versions of it up on the Internet. It would have been fun to know where it had been seen. I keep telling you, no mountains, no temperature layers, I'm not lenticular. Give me a break already. Even without a lot of specific Radionics, you can still find Nature busting its britches up there. Not so much prismatic as it is spilled cans of paint, the following Figure off the Internet would make Renoir proud. Likewise, here's a dramatic homage to Mother Nature at her best. Or somebody's trying a new laser beam technology out for size. The only thing ionnic here are the two lower fourth octave Mobile Scout Ship Condensates sitting right up in the upper right. At any rate, you sure can't fault the histrionics. And the following is a photo from the Internet that is a lot more 'By gosh' than 'By golly'. 'By gosh' there's a Radionic Mother Ship coming faintly through, and 'By golly' look at the nice blush of color up there. The next photo below shows that you don't need to be a rainbow swashbuckler to look pretty. The Figure was taken on August 25, 2018, by a friend of the cause in San Pedro Town, Ambergris Caye, Belize. It was sitting right over his roof. As you can see it is a small Father Ship in back, partially covered by cumulus clouds in front. The cumulus clouds are in close enough to the Father Ship that the magnetics have caused the bottoms to ionnize downward. The right half cumulus clouds are unaffected. Figure 29 - I'm feeling a definite tingle. To repeat, you don't always have to have a brilliant rainbow effect to have a nifty looking rainbow cloud. All you need is a distant forest fire, (the bad part), a late setting Sun, (the good part), and a Negative Pole Radionnic Anchor Ship event happening, (the best part). Looks like the cover meme for a Sci Fi Movie. Figure 30 - The second Sun may be small on our World, but you should see the eclipse.